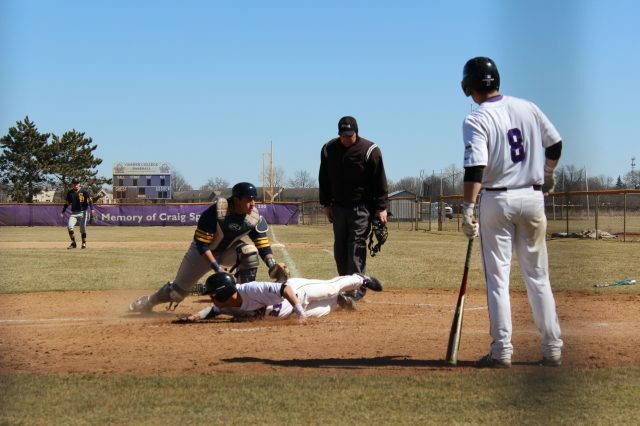 In an extended three-game series on Tuesday, the Goshen baseball team took down the Trojans from Taylor University in all three games for the first time since 1964. Game one of the three game season series was won by the Maple Leafs on March 28 when the Leafs traveled to Upland, IN, where they defeated the Trojans 3-2. On Tuesday afternoon, they hosted the Trojans for a doubleheader. In game one, Goshen struck first in the second inning. Back-to-back doubles by Tanner Logan and Mitchell Wilson gave the Maple Leafs a 1-0 lead. Later in that same inning, Bobby Garcia grounded out, allowing Wilson to come home for an early 2-0 lead for the Maple Leafs. The Trojans would respond with three straight hits in the third inning. Taylor’s TJ Bass would hit a bases-clearing single to even the score at two apiece. In the fifth inning, Ben Longacre broke the tie with a solo shot to make the game 3-2 in favor of the Maple Leafs. The final two innings were scoreless for both sides as Colby Malson came in to close out game one for the Maple Leafs. Final score, 3-2. Picking up the win was junior Colton Daniel. In game two of the Tuesday double header, the Maple Leafs tried to bury the Trojans from the first pitch. In the top of the first inning, sophomore Camm Nickell struck out the side for the Maple Leafs, jumpstarting a big bottom half of the first. The Maple Leafs would draw a series of walks to load the bases. The Trojans’ pitching staff would walk in two runs allowing the Maple Leafs to take a 2-0 lead. In the bottom of the second, the Maple Leafs’ offense would strike again after holding the Trojans to a scoreless top of the second half. Colby Malson singled to reach base with one out. After a Longacre pop out, Clinton Stroble came to the plate swinging on the first pitch, and connecting. He gave the ball a ride to right field, giving the Maple Leafs a 4-0 lead in the second inning. However, the Maple Leafs were not done yet in the inning. Logan reached on a single and eventually stole his way to second, putting himself in scoring position. Wilson then singled and scored Logan, giving the Maple Leafs a 5-0 advantage. In the third inning, the Maple Leafs would push another run across home after Garcia scored yet another run. Maple Leafs hung six on the board in three innings. However, the Trojans were not done yet. They battled back with a four-run fourth inning on four hits to cut the deficit to just two. After a scoreless fifth inning, the Maple Leafs added a seventh run off of an Evan Creager walk, extending their lead back to three runs. In the top of the eighth inning, the Trojans added two runs and cut the lead down to one at 7-6 heading into the ninth inning. The Trojans needed at least one run to extend the game in the top of the ninth. The Trojans would deliver, off of a Bass home run. The game was all square at seven a piece. Malson opened the bottom of the ninth with a single up the middle. Brighton Schofield came in to run for Malson. Two batters later, Stroble launched a double, advancing Schofield to third base. Schofield then came home to score on a wild pitch, giving the Maple Leafs the third game of the series, 8-7. With the three-game sweep, the Maple Leafs improve to 12-17 on the season and 6-6 in the conference.